Kalambo Falls offer two in one – one of the most spectacular waterfalls in this part of Africa and one the most important archaeological discoveries south of Sahara. Kalambo Falls most certainly were known to people for hundreds of thousands of years – much longer than most other great waterfalls of the world. 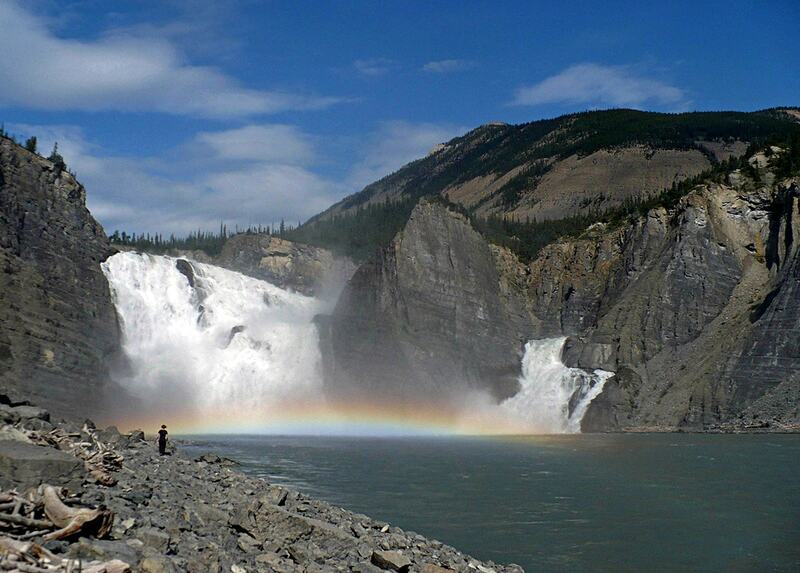 But the first white people saw these falls just one century ago – sometimes around 1913. This is not too surprising – Kalambo River is a comparatively small stream and the falls are hidden from accidental glimpse by a deep canyon below the falls and hilly terrain – above the falls. Kalambo River is rich with falls. Some 11 km upstreams from Kalambo Falls there are four cascades with a total height of 30.5 m – Sansia Falls. This is multiple times exceeded by Kalambo Falls – a 221 – 235 m tall waterfall with a single plunge. 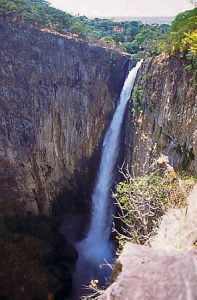 Initially explorers were convinced that falls are more than 300 m tall but the measurements in the 1920s gave more modest result – a bit more than 200 m. In 1956 there were made more exact measurements by J.W.Clayphan, Department of Surveys and Lands, Northern Rhodesia – he obtained 221 m height. Later measurements give more impressive height – up to 235 m.
Kalambo Falls are considered to be the second highest uninterrupted waterfall in Africa after Tugela Falls (South Africa). This seems to be exaggeration: for example, Jinbar Falls in Ethiopia have even taller, at least 500 m tall plunge. From the upper rim of Kalambo Falls opens an impressive sight to Lake Tanganyika plains. Below the falls is located gloomy, incredibly deep and dark canyon – Kalambo Gorge – with a narrow thread of the river far far down. Kalambo Gorge continues for 5 km and then opens up to the plain around Lake Tanganyika. Canyon is approximately 1 km wide and up to 300 m deep. The river at the bottom of this giant canyon in some places has formed a chasm – 3 m narrow, up to 30 m deep gorge. Over the 8 km long distance between the base of Kalambo Falls and Lake Tanganyika the river falls by 160 m, forming two waterfalls in the narrow chasm – 15 m and 9 m tall. The force of water has slowly eroded a very sturdy rock: the Precambrian – early Paleozoic quartzite, finally reaching a layer of shist below it. 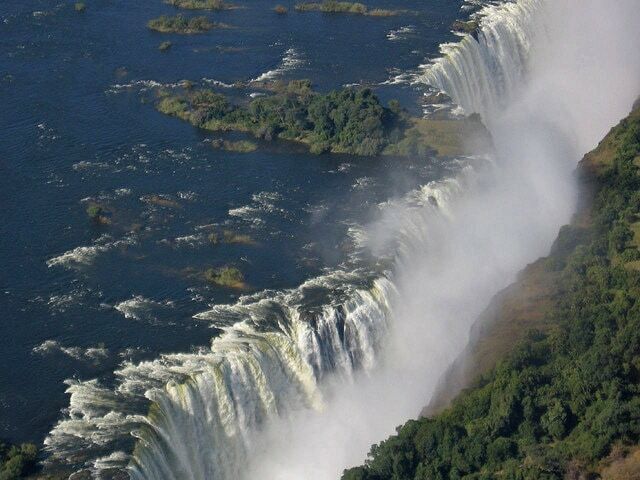 The fact that falls are 221 – 235 m tall but the canyon below the falls – up to 300 m deep – is unusual. Even more unusual it is to see that the upper rim of the canyon further towards the Lake Tanganyika is steeply rising upwards. Water always finds the lowest place where to flow – how could it be that at first Kalambo River was flowing in a higher place and then somehow retreaded to a lower one? This phenomenon has an interesting explanation – the crust of Earth in the area around Kalambo Gorge is rising upwards. Geological processes around Lake Tanganyika are busy creating a new ocean – Lake Tanganyika is becoming wider and the forces of moving tectonic plates are rising the ground in both sides of the lake. The Kalambo River has to claw itself through a slowly rising ground. Thus the river has created the narrow chasm at the bottom of Kalambo Gorge. Near the falls the walls of canyon are vertical cliffs. On the inaccessible ledges of these cliffs are located nests of marabou storks. These large birds are often seen flying in the turbulent air around the falls. The archaeological importance of the site was discovered in October 1953. Few hundred metres from the upper rim of the falls in sharp bends of river were found man made artefacts – sherds of pottery and stone flakes. During the decades of archaeological research scientists (notably – the great explorer of the past of Africa J. Desmond Clark) have learned that here is located one of the most important archaeological monuments south from Sahara. Archaeological evidence shows that people at Kalambo Falls have been living for at least 250,000 years. Settlements here existed for most of the time – up to the recent past, leaving one of the most complete human culture-stratigraphic records in Africa. 250,000 years ago – before the last ice age – Kalambo River before the falls formed a small lake. Climate back then was similar to contemporary climate and a body of water was good selection – it attracted animals and there was plenty of fish. Ancient people mastered making of stone tools – here have been found stone tools made in late Acheulean technique from the local quartzite. Were found also stone hearths and even well preserved wooden club and digging sticks have been foound from this period. Some of the oldest fireplaces in the world were burning here some 60 000 years ago. After Acheulian people here were living people of Sangoan and Lupemban cultures – which are also very ancient Paleolithic cultures. Some 10 000 years BC (imagine – these are recent times by the scale of Kalambo Falls settlers!) here were living bearers of Magosian culture and some 4 000 years BC – Wilton culture, representing Mesolithic time. The eternal settlements around Kalambo Falls continued to thrive even in the Iron Age – around the 4th century AD, when here arrived Bantu farmers. Nowadays around the Kalambo Falls live Lungu people. This area is comparatively sparsely populated. Research at Kalambo Falls continues – as the science of archaeology develops, there are justified expectations that the ancient settlements at Kalambo Falls will provide new knowledge about our common past. J.D.Clark, Kalambo Falls Prehistoric Site, Volume I – III. 1969 – 2001, Cambridge University Press. For some 20 years, Bradt’s Zambia has been widely acknowledged asthe best guidebook on the market, with superior coverage in almost every field.In this new sixth edition, background information – history, culture andnatural history – remains as comprehensive as ever, while practical guidance,including in-depth reviews of lodges, hotels and campsites, is now strongerthan ever for Victoria Falls and Zambia’s top national parks and wildlife areas.